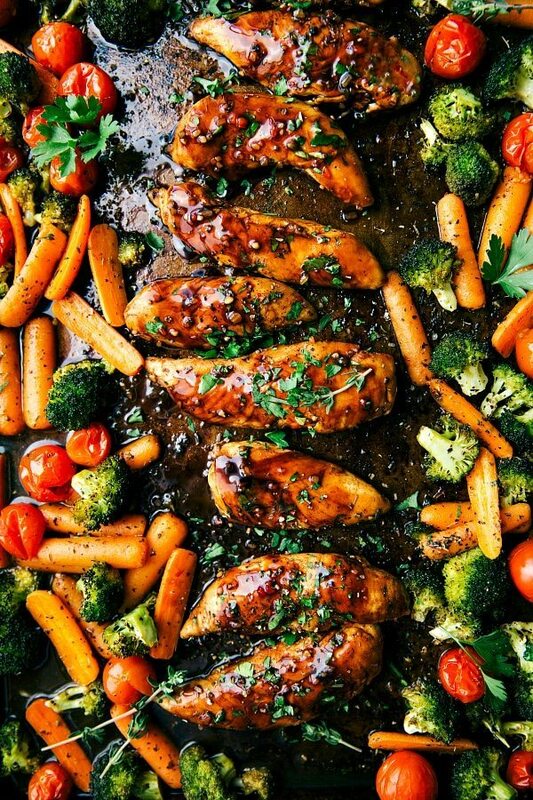 Say hello to one of the EASIEST dinners ever: ONE PAN Balsamic Chicken and Veggies. It’s low on prep time, has few ingredients, and is huge on flavor (while conveniently being super healthy)! There’s a 2-ingredient balsamic glaze which triples as first: a marinade, second: a sauce for cooking, and third: a dipping sauce. This is how I think every dinner should be made ?. Whisk two ingredients together and use that base three times. 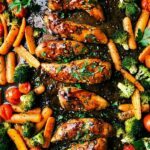 Easy Balsamic Chicken and Veggies made on 1 pan! Great recipe. I can’t wait to try it. Thanks Robin!! And thanks so much for pointing that out, can’t believe I left that out! You can also add noodles for picky starch loving kids and turns out good for all! Good for the fat older man like me and the picky younger crowd. Good flavor for all. Thanks for the recipe. The heading for your recipe doesn’t add in the marinating time. That threw me off a bit. I did make this last night and it was fantastic. I didn’t use the italian dressing because it was too high in sodium. Will have to find a substitute for that. Thanks for pointing that out Sue, I will update that! 🙂 Glad this dish was enjoyed. Thank you for the comment! Made this tonight….great ! I do suggest pan searing your chicken tenders at the end to brown them. I hope this works with drumsticks. I like to pin recipes and not pay attention to details like tenders instead of drumsticks. Bone is better anyways. I’m making this again tonight. I’ve sliced chicken breast when I can’t find tenders. Excellent flavor and perfect for a stormy night with a fire in the fireplace. Love this recipe! I made it yesterday afternoon as a meal prep for lunches this week. I am attempting to count calories and searched this page for nutrition facts but came up empty. Do you have nutrition facts for this recipe? Thank you in advance! Great recipe! Are the nutrition facts accurate for 4 servings? The fat content seems high in particular. Looking forward to trying this recipe. Would you happen to have the nutrition facts for it? I made this and the flavor is excellent. Loved it. Do you know what makes the fat content so high? 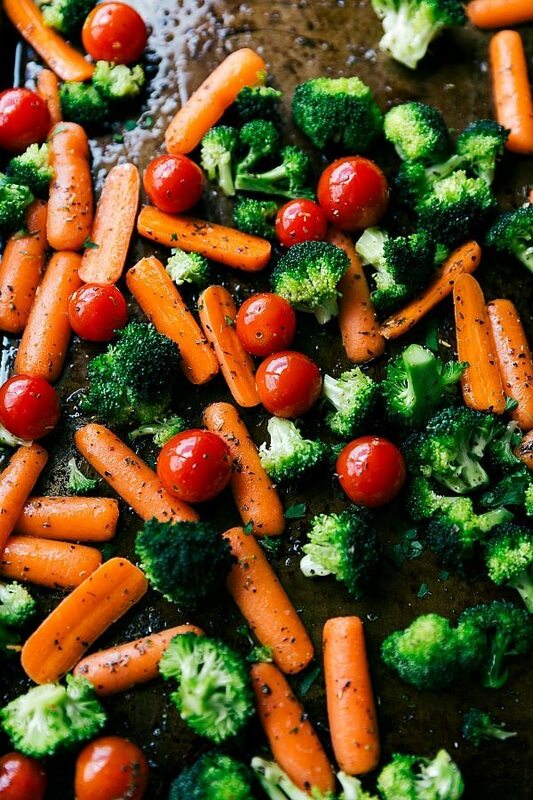 Roasted chicken and veggies doesn’t seem like it would be so high. Made this for my family tonight with Brussel sprouts, small red potatoes,and roasted tomatoes. Oh my!!! Thank you! You are welcome! I’m so happy you enjoyed it!! 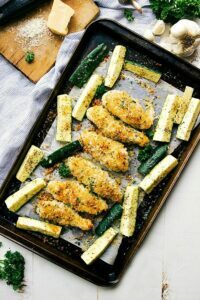 Tried this recipe a few days ago and my whole family loved it! The only thing I did different was add a tiny bit of brown sugar to the sauce at the end for an extra touch of sweetness and added some onions. Absolutely delicious! Sounds great! 🙂 I’m so happy this was a hit; thank you for the comment! Where are all the carbs coming from? Veggies don’t have much carbs and chicken has basically none. Is it the Italian dressing you used? This was amazing. Flavor was awesome !!! My only change in the recipe was that I didn’t have chicken breasts and had to use bone in thighs, so with another 5 minutes of cooking it turned out fabulous !!!!! I will definitely make this again,. I’m thrilled this was a hit! And the thighs sound delicious! 🙂 Thanks for the comment! I wondered why so much fat and carbs, too…three tablespoons of olive oil doesn’t have THAT much fat?!? I’m wondering if the recipe was made with full fat Italian dressing? That would add a lot of fat. I used low fat in mine. Plus, we still had almost half of the mixture left over afterwards, so that surely cut the fat a lot. We aren’t tomato fans, so I threw in some cubed potatoes (frozen hashbrowns) instead. 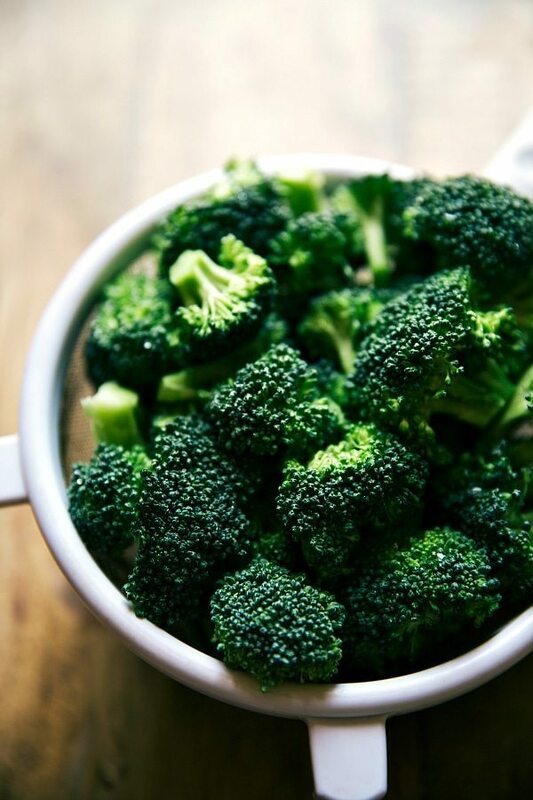 Hubby doesn’t like broccoli, but he ate two plates full…guess it was ok! Lol! 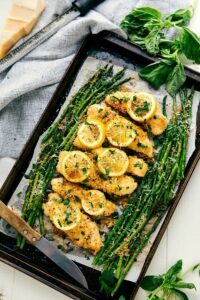 this was linked to a recent foodiecrush post celebrating sheet pans dinners, had to comment on the photography, beautiful dish! 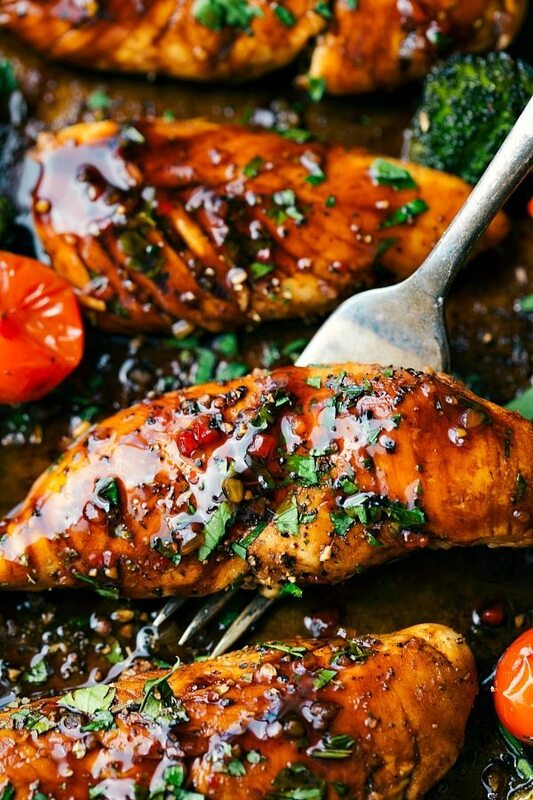 Love balsamic flavored chicken already and to have “panned” it is the perfect idea for this recipe, it usually takes 3 or even more dishes for me, thank you! Sabrina, thank you! I’m glad you enjoyed ? I just made this & it was delicious & easy! Thanks so much for sharing! Thanks for the feedback Gail! This was excellent! 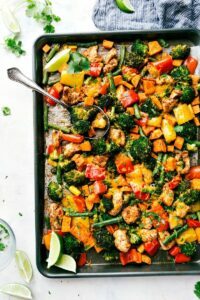 All these sheet pan meals are easy delicious and quick clean up! Thanks for the great recipe! Love this recipe! Has anyone tried it in the pressure cooker? Trying to get the timing right. This meal was one of the best one pan dinners I’ve made! I’m going to make this once a week! Thanks so much for sharing! What a compliment!! I’m so thrilled this was a hit 🙂 Thanks for the comment! I made this tonight and it was SO DELICIOUS! For the veggies, I used red onion, broccoli, and bell peppers because that’s what I had in the fridge and is was super delicious. Can’t wait to make this again! Has anyone tried it with shrimp?? I’m a novice cooker and mom to a toddler that is working on a list of go-to meals. This one makes the cut. It’s fairly easy even for the non-experienced such as myself, uses basic ingredients, and very tasty. I served pasta-roni fettuccine alfredo as a side, and the meal was a big hit. I’m not big on vegetables, but these are tasty enough that I didn’t have to force myself to eat them. I actually enjoyed them. Thank you for a very family-friendly recipe. I made it exactly how it shows but it came out very wet and not crispy or grilled like yours. I used regular Italian dressing. Please help! Tried this recipe tonight over cauliflower rice. I look forward to trying your other one pan meals. Made this recipe, great taste. I did not marinate anything because I am lazy. I just threw everything on the pan and covered with homemade Italian dressing using balsamic vinegar. Easier that way. Also used boneless chicken thighs, my go to. Great recipe, thanks for sharing. 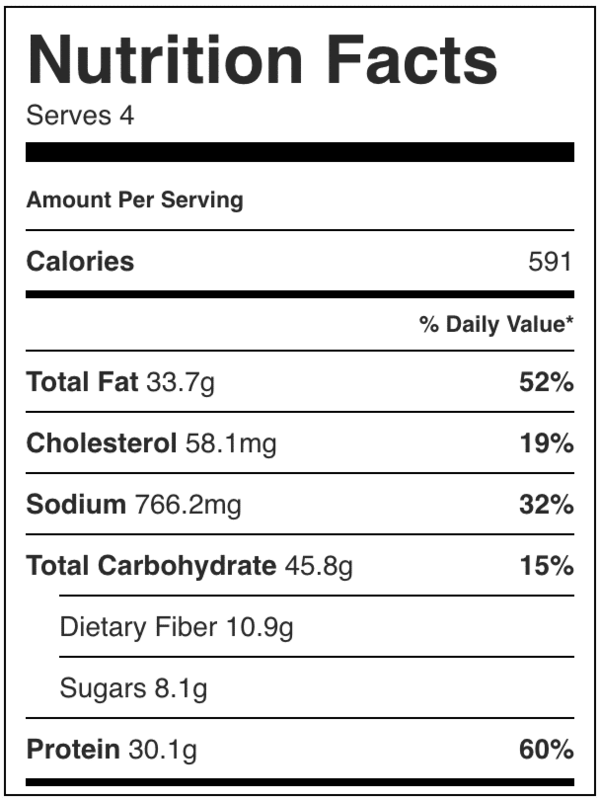 One question…the carbs listed seem high…? Can’t seem to figure out why? Any ideas? Thanks. This has been on my regular rotation for over a year now! We love it! It is delicious no matter what italian dressing I use. I am OBSESSED with how the broccoli turns out. So yummy! Thank you for posting such a tasty and easy recipe! It is always so wonderful to find a staple. 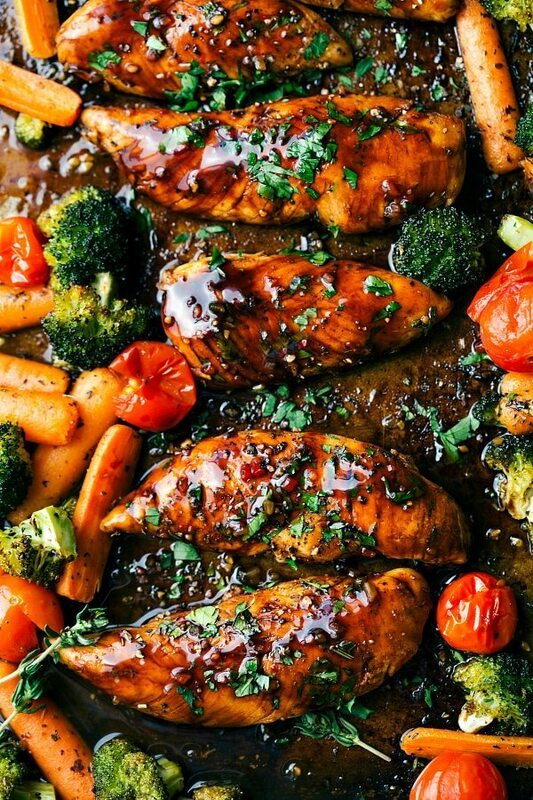 HI Chelsea, I just cooked the ONe Pan Balsamic Chicken and veggies today and it is very tasty. But, I do have a question…I wanted mine to look like yours in photo and instead of the wonderful BBQ coloring you have, the one I did is dull without the hightlighting. Could it be that I may have missed something within the recipe? Thanks for posting the recipe for us. So happy you enjoyed it! 🙂 I didn’t leave anything out of the recipe, I’m wondering if it is just a difference in lighting and editing? I photograph my food in a very bright white room and increase saturation when editing. Other than that it could also be a difference in actual brands being used? Sorry to not have a better answer! Awesome! I will definitely share this with my family. Thanks for sharing a great recipe.